Are you taking advantage of mapping? Smartphones with GPS capability and online mapping applications have made finding addresses an easy task. Does your utility take advantage of any of the many electronic mapping applications that are available? Many utilities have implemented Geographic Information Systems (GIS) to replace their reliance on paper maps. In addition to creating digital images of paper maps, GIS maps include attributes of each mapping layer. These attributes can include such things as water line size, pipe material and year installed. Or for a valve, the attributes might include manufacturer, model, year purchased and direction the valve opens. Even if your utility hasn’t implemented a Geographic Information System, several online options exist for locating an address. Google Maps, Mapquest and Bing Maps all will display a map of an address, using nothing more than the address itself. They also will provide turn-by-turn driving directions to the address. Some utility billing systems have integrated mapping within their billing software. Logics’ Utility Management system is one such application. Below is a screen shot of the Mapping tab from the Account Console of Logics’ Utility Management system. Clicking on the image will open a larger image in a new window. As you can see, the system displays a map with a push pin at the exact service address. Meters are often the last layer added to a GIS system, and they represent the point at which billing software and GIS systems intersect. For a utility with a GIS system mapped all the way to the meter level, the above map could be replaced by their GIS map. Interested in integrating maps with your billing system? If you are interested in learning more about integrating maps, either Google maps or your GIS system, with your billing system, please give me a call at 919-232-2320 or e-mail me at gsanders@logicssolutions.com. Do you offer your customers choices? Do you offer your customers choices in how they can pay their bill? According to the 2012 Fiserv Billing Household Survey, 76% of American consumers use more than one method to pay their bills each month. The infographic below is from the survey and highlights several key trends. Clicking on the infographic will open a larger version from the Fiserv website. Let’s examine some of the key points illustrated by the infographic. 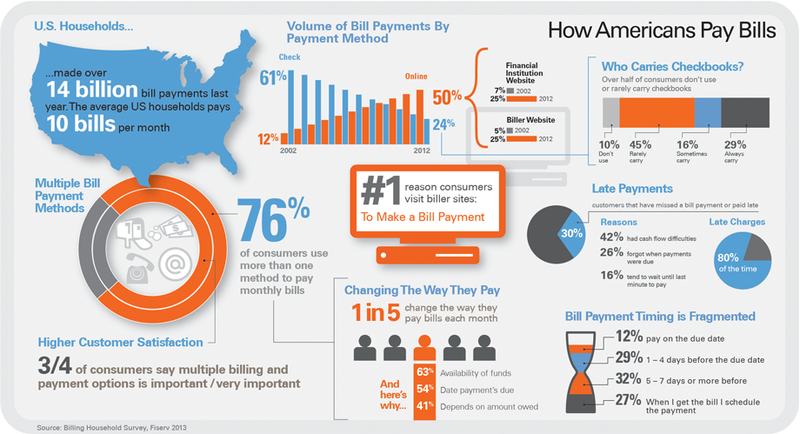 As mentioned above, 76% of consumers use more than one method to pay monthly bills. This could be due to personal preference or, more likely, to the unavailability of being able to pay some bills online. More surprisingly, 20% vary how they pay bills each month, based primarily on availability of funds and due dates. For the last 11 years, check payments have steadily declined while online payments have more than quadrupled. 50% of bills are now paid online, split equally between using online banking and paying at the biller’s website. As this trend continues, you can expect to see more payments being made at your website (if you offer online bill pay) and through online banking. If you aren’t receiving online banking checks electronically, your cash flow will suffer as more and more customers migrate from writing checks to paying bills through online banking. The number one reason given by consumers for visiting a biller’s website is to pay a bill online. If you’re not offering online bill pay, you’re missing out on this website traffic. When was the last time you reviewed your payment options? If you have questions about your existing payment options or would like assistance in exploring additional payment methods, please give me a call at 919-232-2320 or e-mail me at gsanders@logicssolutions.com. Does everyone on your cut-off list have a current deposit? Nearly two years ago, I wrote about adequate security deposits. The last section of that article included some best practices for deposits. Today, let’s take a more in-depth look at one of them. The purpose of security deposits is to insure you don’t get stuck with unpaid final bills when your customers leave. Not having a security deposit, or having an insufficient one, leaves your utility vulnerable to bad debt and write-offs. There is no guarantee, but common sense tells us that customers on the cut-off list pose a greater credit risk than good paying customers. Customers who don’t pay until being cut off for non-payment while they have service with you stand a greater chance of not paying their final bill after they move away. A number of utilities have policies requiring all accounts on the cut-off list to pay a deposit if they don’t have one, or to bring an out-of-date deposit up to the current amount. This means a customer on the cut-off list needs to pay their outstanding balance, the cut-off fee and any additional deposit required to bring their deposit up to the current amount. A policy such as this safeguards the utility against potential losses when the customer closes their account. Perhaps you might forgive the first time on the cut-off list as an oversight, but certainly repeat offenders should be required to comply with this policy. If you don’t have a policy requiring accounts on the cut-off list to post a current deposit, I strongly encourage you to adopt one. When was the last time you reviewed your deposit policies? If you have questions about your deposit policies or would like assistance in reviewing them, please give me a call at 919-232-2320 or e-mail me at gsanders@logicssolutions.com.